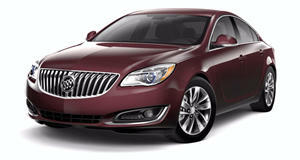 Buick's omission of a regular four-door sedan is more than an oddity, it's a sign of what's to come. Those who paid attention in biology know that an evolved form of any given species must first emerge from the current lineage and blossom before its preceding category dies out, but the new pair of Buick Regals from GM seem to show that the extinction phase of the parent sedan species is already underway. With SUVs and car/crossover mashups outselling sedans, it was only a matter of time before some models shed their ancestral sedan parents in favor of body styles that will actually sell. The new Regal does just that with the new TourX and Sportback. The Regal that offers the most apparent differences to the passing onlooker is the TourX, a five-door Opel Insignia Grand Tourer wearing Buick badges that makes no effort to hide the fact that it’s a wagon. While it’ll quiet wagon-loving enthusiasts for now, it’s a risky move on Buick’s part given how American’s previously shunned the bulky bodies. On the other hand, it’s anyone’s guess as to how it’ll be received. The world has been voting in favor of SUV versatility and car-like handling with its many currencies, and the Regal TourX is an attempt to see if America will gobble this up as well. Buick is even going as far as to call the TourX a crossover. Duncan Aldred, vice president, global Buick and GMC stated, “Regal TourX is a crossover in the truest sense of the word, with the drive dynamics of a car and the versatility of an SUV.” Even without Aldred’s comments, Buick’s intentions are seen in the hardware. Wearing nearly the same sheet metal as the Insignia Grand Tourer, the Regal TourX dons body cladding and a boost in ride height to make it more of an Audi A4 Allroad or Volvo V60 Cross Country. Roof rails come standard as well as all-wheel drive to help sort out slippery situations. With 73.5 cubic feet of storage space behind the front seats, it can cram more inside than its Volvo, Audi, and BMW competitors. Power comes from a 2.0-liter turbocharged four-cylinder engine making 250 horsepower and 290 lb-ft of torque. Output is sent through an eight-speed automatic and through an intelligent all-wheel drive system with active twin-clutches. Like many other luxury cars, the rugged exterior is contrasted by a comfortable interior and easy to use features such as a power liftgate, OnStar with a 4G LTE hotspot, Apple CarPlay and Android Auto, driver aids such as Lane Change Alert, Rear Cross Traffic Alert, Rear Park Assist, and even a pyrotechnic pedestrian safety system that blows the rear of the hood up by four inches to cushion the blow of a falling jaywalker. Enticing as the TourX may be, especially when wrapped in a pretty package (pretty as long as you can ignore the plastic “armor”), the Regal Sportback commands a bit more interest to those who value aesthetics. That's because the Sportback merges the sedan body style with a five-door hatchback, resulting in vehicle similar to a Tesla Model S or Cadillac Escala Concept. Like the two hatchback models, the Regal Sportback has a hatch that opens along with the rear window, allowing for the storage of larger items. Essentially, it’s a wagon for an owner who doesn't want anyone to know they have a wagon and can manage with a total of 60.7 cubic feet of storage with the rear seats folded down. Aldred put it back into perspective, saying, “The new Regal Sportback was developed with today’s active, independent, premium car customer in mind.” “They have an SUV in the garage and are looking to complement it with a sport sedan, but have an appreciation for the usefulness of a versatile cargo space when an occasional need arises.” Like the Regal TourX, the Sportback is powered by a 2.0-liter turbocharged four-banger except this time a front-wheel drive option is available along with all-wheel drive. On tap is the same 250 horsepower and 295 lb-ft, although torque is dialed back to 260 lb-ft on the front-wheel drive model. While the transmission remains an eight-speed for the AWD model, the front-wheel drive version gets a nine-speed auto. Despite the hatch, the Sportback is 200 pounds lighter than the previous generation Regal and even though it's 3.4 inches shorter than the TourX, the Sportback’s wheelbase is 3 inches longer than its predecessor. Because it's a Regal, the Sportback also carries over all of the creature comforts that the TourX has, save for the automatic liftgate, and gains Signature Buick QuietTuning tire insulation technology to calm road noise on front-wheel drive models and uses a premium five-link suspension to accomplish the same task on all-wheel drive models. Interested? Well you won’t have to wait long because both models will be on Buick lots by the fourth quarter of 2017. Once there, buyers can choose between four trim levels for the Sportback, including Regal, Preferred, Preferred II, and Essence or TourX, Preferred, and Essence trims for the TourX model.